NOTES: Dallas was 0 for 4 on power plays and is 1 for 13 in the series. 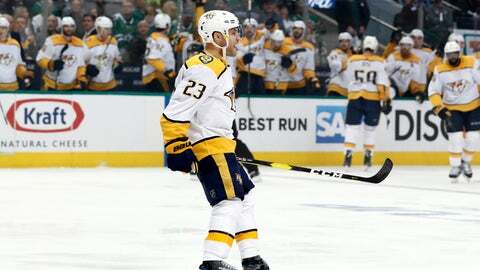 Nashville is 0 for 8 after failing to score on its only chance with an advantage. … Nashville is 3-0 in Dallas this season, after also winning both regular-season games there. … Stars C Jason Dickinson was bleeding after being slammed into the boards by Colton Sissons late in the first period. It was the second time Dickinson took a big hit in this series. He went to the locker room and went through concussion testing after a collision with Boyle in Game 1. … Like Boyle, RW Wayne Simmonds is week-to-week. Simmonds took a shot off his knee in Game 2. … A Stars fan was removed from the area near the Nashville penalty box after the second period. … Dirk Nowitzki was back in the building where a week ago he announced his retirement after a record 21 seasons with the NBA’s Dallas Mavericks and was honored with an elaborate ceremony after his final home game. The crowd went wild when Nowitzki was shown in a suite wearing a Stars playoff T-shirt and waving a rally towel.